Are you Planning to Study Abroad? Then first gather the all the necessary documents that are required to study Abroad. Nowadays Getting Admission in your dream country is not that hard, but it involves a lengthy Documentation Process. While applying to any University/College in your Destination you need to furnish a long list of documents to each and every university which is very cumbersome and painstaking. So before applying to any university first we should prepare the list of universities you are applying and the Copies of Documents required to be sent to the university where you wish to apply for admission to ease your application process. But the Checklist to study abroad may vary from individual to individual & their chosen destination. By compiling various universities and colleges here we have provided the exclusive list of Documents that are necessary during the application process. Check the list and prepare all the documents before applying to the university. The application form received from the University. During applying to the universities sometimes you also need to submit some necessary documents like SOP (Statement of Purpose)/Essay, LOR (Letter of Recommendation)/Reference Letter, Resume/CV, Work Experience Documents. Depends on the country you are applying you need to submit these documents during application or Visa Process. Once after receiving all the required documents the university/college will analyze your academic and test scores and will send you the Offer Letter / I20 form as an indication to the accepting your admission. Offer Letter/I20: An offer letter or I20 Form (for USA) is a letter of acceptance issued by the University/College where you have applied for admission. The University will issue the Conditional or Unconditional offer letter to you upon acceptance based on the documents submitted by you while applying. Where the Conditional Offer means the confirmation of acceptance subject to fulfillment of requirements mentioned in the Conditional Offer Letter. The Common Conditions in Conditional offer letter include Minimum IELTS/TOEFL Score required or Minimum GRE/GMAT Score required or Final Transcripts of your latest academic qualification, etc. On the Other hand, the Unconditional offer letter means the confirmed admission letter subject to Tuition Fee deposit before the due date mentioned in the Offer Letter. Statement of Purpose/Essay: While joining in University/graduate schools/professional schools you need to tell them why you have specially chosen that university and course through the Statement of Purpose. The Statement of Purposes is a brief and focused essay on one’s career and research goals and accomplishments so far to achieve them. It is an important document while applying to any professional program in the United States. The Universities often use this Sop as a Yardstick to assess the capabilities of a prospective student in terms of critical thinking, analytical abilities, aims, interests, and aspirations. The Sop is also known as a Graduate School Essay and sometimes call it as a “Letter of Intent”, “Letter of Intention”, “Statement of Intention”, “Statement of Intent”, “Statement of Interest”, “Goals Statement”, “Personal Narrative”, “Personal Statement”, or “Application Essay”. Each University has its own regulations to accept SoP Form, but in general, most of the universities accept 1-2 Pages of SoP. And most of the Admission Committees look for a short, crisp, and ideologically clear SoP. Letter of Recommendation (LOR)/Reference Letter: A Recommendation letter is a letter requested to be written about us by someone. Typically the Letter of Recommendation related to employment, admissions to institutions of higher education or scholarship eligibility. The writer assesses qualities, Characteristics, and capabilities of the person being recommended in terms of that individual’s ability to perform a particular task or function and writes the letter of recommendation. Resume/CV: A Resume is a Document that includes the individual details like their educational background and skillsets. A Typical resume contains personal details, contact details, education, and work experience details of a person. The resumes are used for many purposes like to secure admission or new employment. The Resume is a major document while screening applicants when seeking admission. The Documents given above are the general documents required to submit while applying to any university in abroad. But these required documents may sometimes vary depend on the country and university you are applying. Mostly the abroad universities have its own standards to provide admission to the students. To know the admission requirements for abroad countries like the USA, Canada, Australia, Newzealand, UK and Europe check the below links. 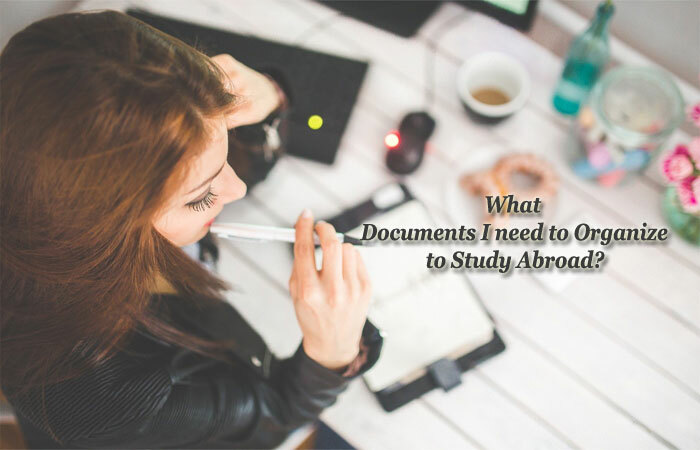 We have compiled the list of required documents for each country and come up with the list of Documents required to Study Abroad. Check those and organize all the documents to apply for your chosen university. USA – F1 Visa Form. UK – Study Visa Form. Australia – Study Visa Form. Canada – Study Visa Form. Family registration form (if applicable). For the guidance of the candidates here we have also provided the complete visa process for each country along with the documents required to submit to apply for Abroad Visa. So check the visa process of selected country and follow the given steps to get your visa approved. International Immunization and Vaccination Records.